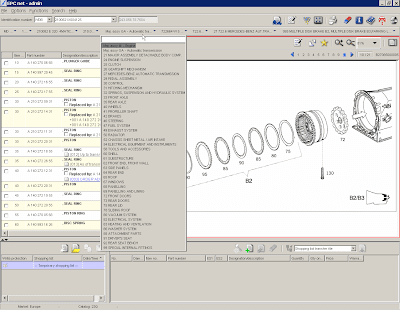 Mercedes EPC net represents the latest development in EPC Flexible Publishing. EPC net is available both online and offline. 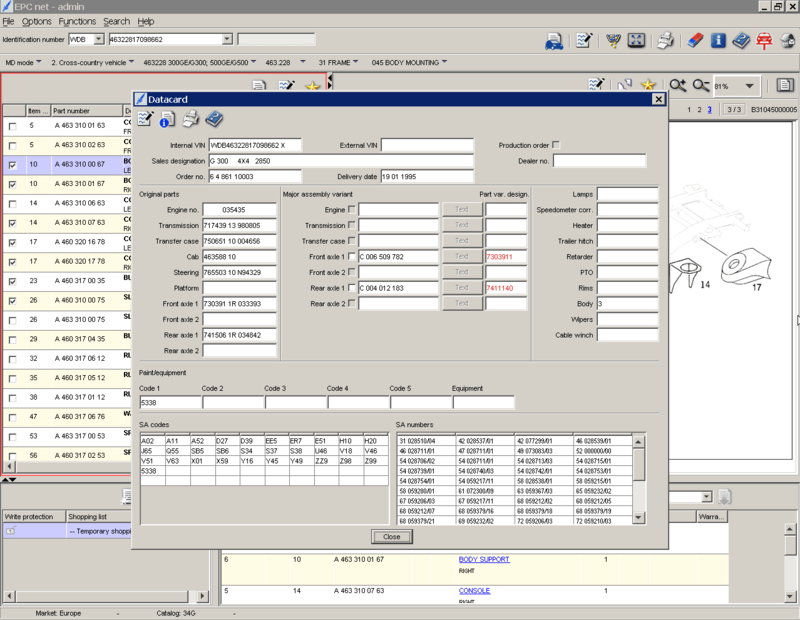 All the functions available in EPC Flexible Publishing have been fully integrated into EPC net. The modern user interface applying standard Windows rules serves to significantly improve user guidance and navigation. Modern user interface using standard Windows rules Users will immediately note the modern user interface and the simple navigation using standard Windows rules. You can open functions using the icons (a) or the Menu bar (b). Tooltips are provided to explain icon functions (c). Hovering the mouse pointer over an icon causes the tooltip to appear with a description of the icon’s function. The combined pull-down menus (d) with input fields are available in EPC net for simple navigation within the catalogs/groups/subgroups. You can use your mouse or keyboard to operate EPC net. 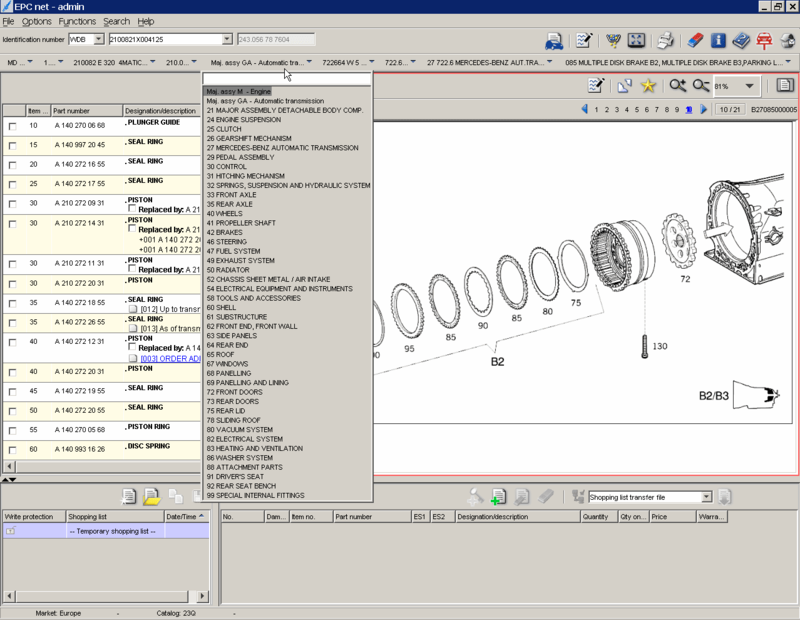 Most of the keyboard shortcuts used in EPC Flexible Publishing are also used in EPC net. For parts identification, EPC net requires at least a 6-digit model designation. Ideally, parts identification should be done using a vehicle identification number so that the datacard can be used in the process. 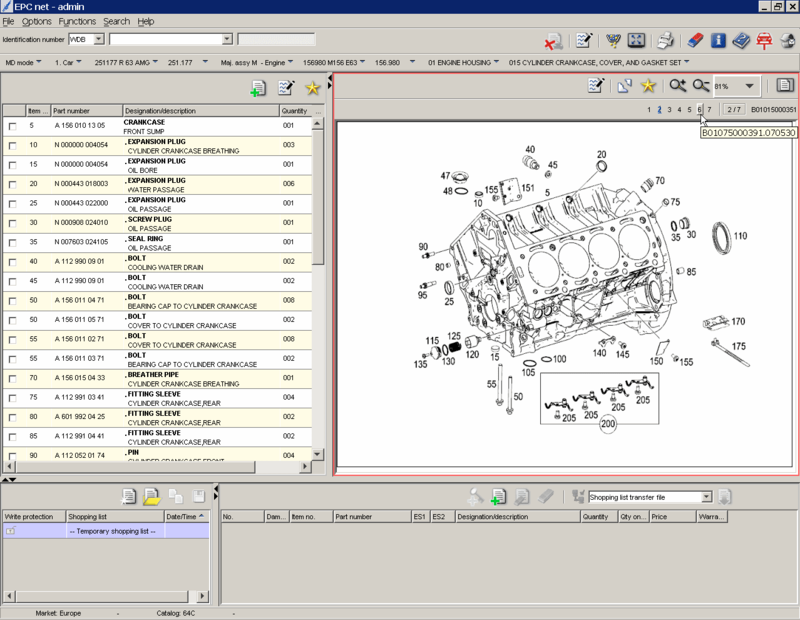 The datacard must be used when looking for parts that are color-specific or where the search depends on what equipment is installed in the vehicle. 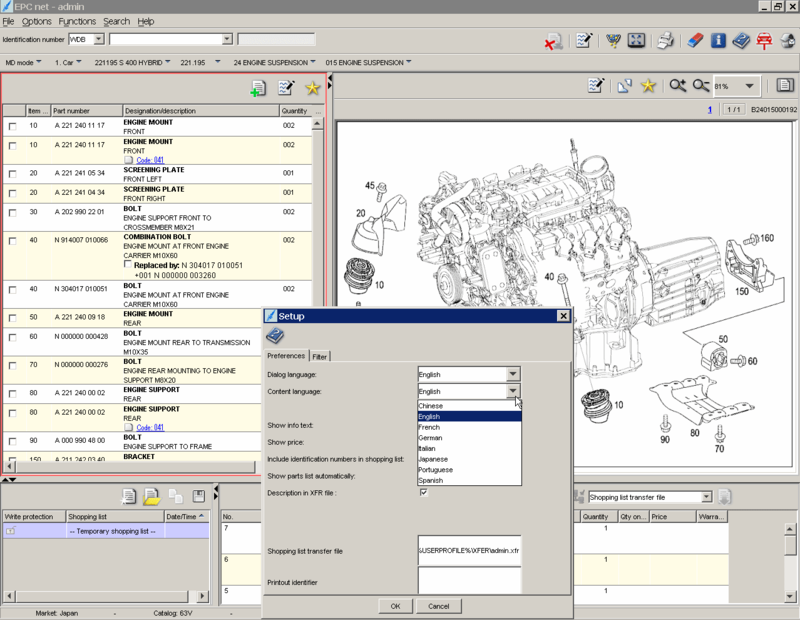 Reduced number of windows Functions that were spread over several windows in EPC Flexible Publishing have been condensed onto one window in EPC net.The EPC net window is subdivided into the following sections: Mercedes EPC net Picture The picture has been supplemented with different zoom functions, and can be shown in a separate window using the icon. 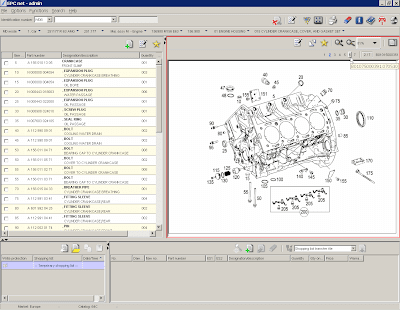 Mercedes EPC net Parts list All the part numbers for the entire subgroup are shown in the parts list. 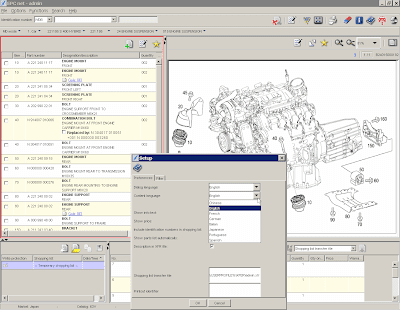 Footnotes and code information (passenger cars), SA/component information (commercial vehicles) and construction kit information (BUS) can be displayed via links in a separate window. Mercedes EPC net Shopping list The contents of the shopping list (e.g. quantity) can be changed directly in the individual columns.One important new feature is the “Show part context” function. When you reopen a saved shopping list you can click on the part designation in the form of a mouse-sensitive blue link to extract the part context directly from the shopping list.This saves you the trouble of reentering the vehicle data and the group/subgroup. Mercedes EPC net List overview The “List overview” can help the EPC net users with shopping list administration. Saved shopping lists and a “temporary shopping list” can be used at the same time. 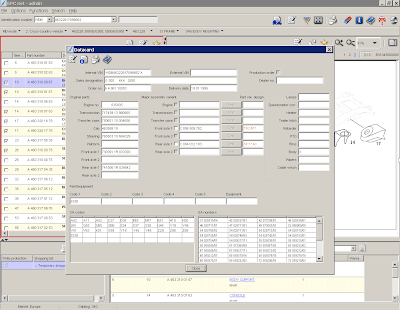 The icon can be used to create, show, delete, copy and print shopping lists.The active area of the EPC net window is marked with a red frame. You can change the size of the individual EPC net window areas via the respective dividing lines. Double-clicking on the dividing line between the picture and the parts list causes the picture to be arranged above the parts list. The , and icons can be used to show/hide individual areas of the EPC net window and to individually change the column widths as required. EPC net is available both online and offline The various options at a glance: Online server operation via Internet or intranet. Local installation: offline operation for day-to-day use – updates via online downloads. Offline mode: updates from DVD.